Tuesday June 5th 1883 I sewed most of the day. Lee brought Edith over but took her home before supper it looked so much like rain I worked a little in the evening. 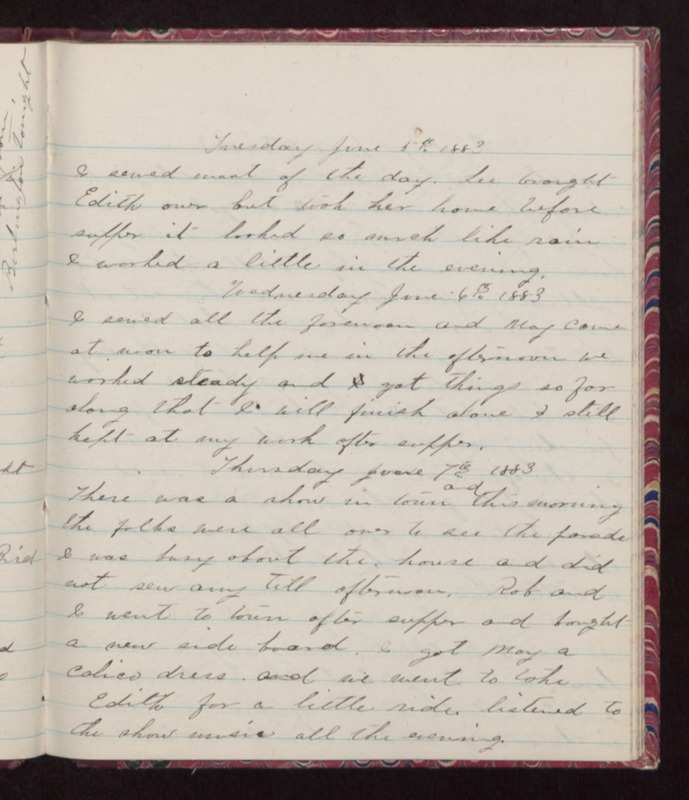 Wednesday June 6th 1883 I sewed all the forenoon and May came at noon to help me in the afternoon we worked steady and got things so far along that I will finish alone I still kept at my work after supper. Thursday June 7th 1883 There was a show in town and this morning the folks were all over to see the parade I was busy about the house and did not sew any till afternoon. Rob and I went to town after super and bought a new side board. I got May a calico dress and we went to take Edith for a little ride listened to the show music all the evening.